According to the Anxiety and Depression Association of America, anxiety disorders are the most common mental disorders in the United States. They affect 40 million adults over the age of 18, which is approximately 18 percent of the US population. Of these people, only one-third seek help for the condition. It is incredibly important for those who have substance abuse and anxiety disorders to seek professional help. Substance abuse and addiction can be made worse when combined with anxiety disorders. Luckily, there are treatment centers for anxiety disorders and substance abuse. There are many subcategories of disorders that doctors at rehab and recovery treatment centers are able to treat, which include acute stress disorder, agoraphobia, social phobia and others. When looking for a treatment center, make sure you find one that focuses on dual-diagnosis cases. These programs will treat both the underlying problem and the substance abuse that is taking place. Patients will go through detoxification, rehabilitation and appointments for proper medications to help them get back to a healthy lifestyle. These disorders are often treated with prescription medications such as anti-anxiety medication, beta blockers and antidepressants. Combining these medications with substance abuse can be dangerous, so it is important that people with substance abuse or addiction issues seek help first. A rehabilitation center specializing in anxiety disorders and substance abuse should be found, and we can help. Call us at 1-888-319-2606 Who Answers? to find one near you. Our 24-hour hotline is available seven days a week, so you can always get the help you or a loved one needs. Acute stress disorder. Acute stress disorder is usually severe anxiety or stress that develops within a month of exposure to a traumatic event. Panic disorder. Panic disorder is an anxiety disorder that results in severe panic attacks. The disorder may also lead to behavioral changes that last at least a month. Agoraphobia. Agoraphobia is an anxiety disorder that is normally characterized by a person having anxiety in environments that may be difficult to escape from. The person may also believe it will be hard to get help, and this can set off an attack. Social phobia. Social anxiety disorder is a fear of public embarrassment or humiliation. Specific Phobia. Specific phobia is a type of anxiety disorder that refers to a person having irrational or unreasonable fears when exposed to certain objects and situations. Obsessive-compulsive disorder. OCD is an anxiety disorder related to a feeling of uneasiness and apprehension or fear. People with OCD may complete repetitive behaviors to reduce the resulting anxiety. For example, a person may compulsively clean, check locked doors again and again, hoard, or have nervous rituals, like turning a light on and off a few times before leaving the room. Post-traumatic stress disorder. Any event that results in psychological trauma can cause post-traumatic stress disorder, also known as PTSD. The most common precursors are exposure to death or the threat of injury. Generalized anxiety disorder. Generalized anxiety disorder is also known as GAD. It is characterized by constant worrying or anxiety that can happen during a variety of events or activities. According to the Anxiety and Depression Association of America, GAD affects 6.8 million adults in the United States (around 3.1 percent of the population). Of those who are affected, women are twice as likely to suffer from generalized anxiety. 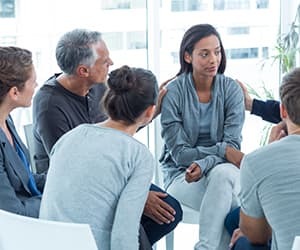 Treatment centers may be inpatient or outpatient programs, but many people with dual-diagnosis issues will be best treated if placed in inpatient therapy. This therapy provides recovery therapists who can help you understand why you or your loved one may have begun to use drugs and/or alcohol. The medical provider can also monitor withdrawal symptoms from the detoxification program. Since trial and error is part of the way doctors find the best treatment for depression and anxiety, patients in inpatient facilities may be placed on the right medications faster than those who leave and return, as doctors won’t see all the side effects as they occur. If a patient is an inpatient, a doctor will be able to adjust the medications as needed. Finding the right addiction recovery program for anxiety disorders and substance abuse is simple. You can call us at 1-888-319-2606 Who Answers? to locate a treatment center near you. [1.] American Psychiatric Association. (2013). Diagnostic and statistical manual of mental disorders: DSM-5. Washington, D.C: American Psychiatric Association.